The Friday before Good Friday is for Our Lady of Sorrows. It acknowledges Mary’s seven sorrows stretching from Jesus’ presentation at the temple and culminate in her pain at losing her only child. 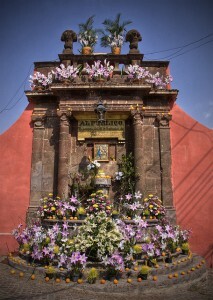 Altars throughout town contain symbolic elements of mourning such as sour oranges, chamomile, wheat and purple cloth. Bitter oranges represent Mary’s sorrow and gold is place on the oranges representing Mary’s tears. The wheat (grown in darkness and light gold of color) represent Jesus’ secret of knowing a horrible death awaited him and is what communion bread is made from. Chamomile is for humility. Purple, in addition to mourning, represents royalty since Mary is Queen of Heaven. The white clothes and flowers are for Mary’s purity. Also chilacayote, a kind of sweet pumpkin, represents the sweetness of Mary’s maternal love for Jesus. Along with other flavored waters the chilacayote is frozen into popsicles representing Mary’s tears changed into something good. It is also the motivation for children to view as many altars and receive as many popsicles as possible! Many altars will play the music of the Tenebrae. This haunting composition was by Juan Gutierrez de Padilla especially for San Miguel’s Easter season in the mid 1600’s. Families, local businesses, and municipal fountains offer visitors to their altars popsicles made from colored water which represent the tears of Our Lady of Sorrows. Tradition held that the tears of sadness are transformed into gifts providing joy. In Colonial times there were 300 factories run by the indigenous and 50 by the Spanish making fabrics like we see today in multicolored napkins for sale in San Miguel. Our Lady of Sorrows was the patroness of these workers whose work was centered around the street called Baranca. 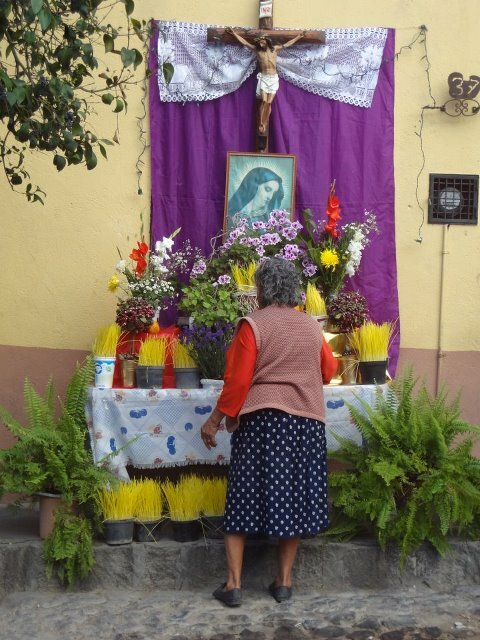 Near there, on Piedras Chinas, a small chapel was built in her honor her seven sorrows. Tonight the chapel is open and surrounding area filled with altars and street vendors providing food and drink. 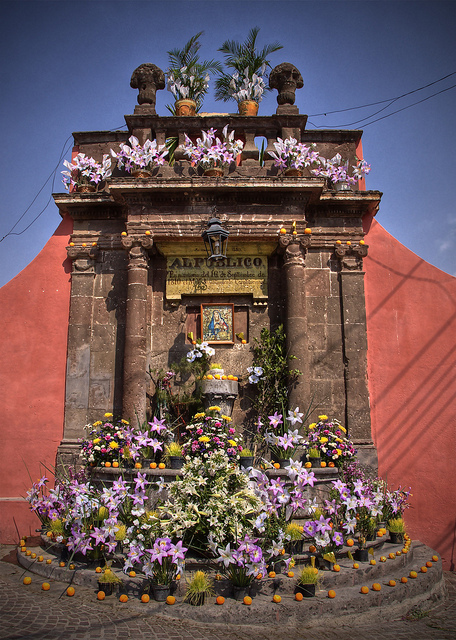 The altars are constructed all day with visitors strolling to visit between 6PM and midnight. Several of the images of Mary as Our Lady of Sorrows featured in local churches (Santa Escuela, San Juan de Dios and San Francisco) are strikingly similar in appearance and are thought to created by the same person. However, it was customary to not sign religious statues so the artists remain unknown. After Vatican Two the observed day of Our Lady of Sorrows was moved to September 15th, a day before Mexican Independence Day. However, San Miguel retains the original date during the Easter season. In recent history the local government desired a competition among the altars but the public did not like the idea and preferred to continue the customs nostalgic of this ancestors.